Of course, you can come as early as Friday, July 11. It will not be a problem with a hotel room, but we have to know this much earlier so we can make the arrangements. The Meeting will take place about 220 km from Szczecin, 45km from Slupsk, 70 km from Gdansk and 11 km from Leba / Open Baltic Sea. We have almost 15 pontons in very good condition (Type 180, 190, 220a and 220S). I own a Type 190D from 1959 with Webasto sunroof and I am the private organizer with many friends. Please be our guest. 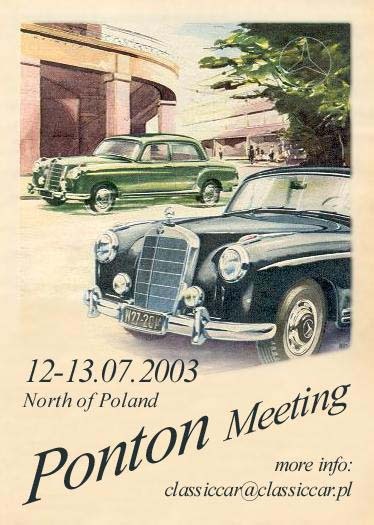 Join us and spread the word about our ponton meeting with your friends. If you can come, contact us and we will send all the papers connected with making a room reservation. A room for 2 people with bath and breakfast is € 25 (Euro) / 100 PLN.